Life certainly has become since the time online food ordering has become organized! And that isn’t all! Today, you can have a great discount on the same as well. Many online service providers have stepped onto the virtual platform offering easy online food ordering and delivery. One name that has made a positive mark amidst the new age online shoppers as well as the young foodies is Innerchef. This brand has been a popular brand where you can browse through the delectable platters on offer and then get the same at a great discount. So treat your friends or pamper your taste buds within your budget. From the best of the cash back offers to the pocket-friendly promotional offers and other deals and coupon codes, there are plenty of such deals available in HappySale. So simply read about the deals and then select the one you like best! Get flat 10% off discount on shopping feast category. Apply coupon code at check out page to get discount!! Valid for all users. Order food online at InnerChef and get flat 30% cashback. Offer applicable for both old and new users. Valid only on payments done with PayUMoney wallet. No coupon codes and minimum cart value required to get this offer. Hurry up and place your orders. Innerchef referral offer is here. Go to 'share & earn' section in the app. Invite and gift your friends Rs 51 by using your unique referral code. Get Rs 51 for each friend that orders. Gift more and get more. Innerchef offers best price on food orders in Hyderabad. Order food from menu like Butter Chicken with Lachcha Paratha, Melon Mint Melody Salad, Veg Penne Pasta + Grilled Chicken Red Pasta, Roti Sabzi Dal Chawal etc. Order now and get upto Rs 175 disocunt. Get flat Rs 100 OFF on orders of Rs 300 at Innerchef. Pay through paytm wallet and get 20% cashback. Apply this coupon code while placing order at check out page to get discount. Buy today. 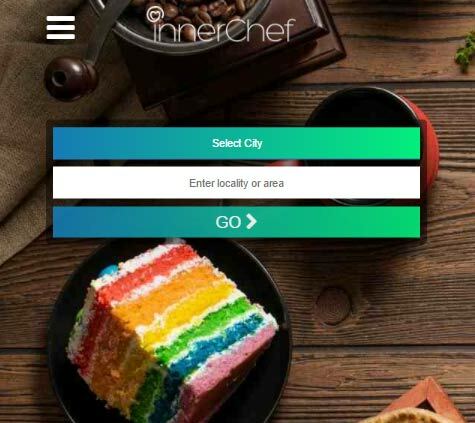 Order food from Innerchef app and get flat Rs 100 OFF. Offer valid on orders of Rs 300 or more. You can also avail 20% cashback through Paytm made payments. Use the Innerchef promo code given and avail the discount. Get it now. Now Innerchef offers you more savings on your food orders. Get flat 20% cashback when paid through Freecharge wallet on your orders. Maximum cashback availed can be is of Rs 75 and can be availed twice per month. No innerchef coupon codes needed to avail the offer. Now order your favorite food online from Innerchef and enjoy Rs 50 cashback when paid through Mobikwik. Maximum cashback can be of Rs 50. Offer for a limited time and valid only for first time user. Grab your meal before the Offer period lasts. Click now to activate the offer with no coupon codes needed. Now order your favorite food online from Innerchef and enjoy Rs 50 cashback when paid through Mobikwik. Offer for a limited time and valid only for first time user. Grab your meal before the Offer period lasts. Click now to activate the offer with no coupon codes needed. 21st century lifestyle is all about great opportunities and expansion that makes everyday smooth and hassle free! One of the best online services that has been extended to this new age life is the delivery of food online, where you have the chance to select from the your choicest menu and place your order and have the same delivered to you within the time committed to you. One of the brands that have made it big in the recent times is Innerchef. That is not all! This brand welcomes more customers by providing discounts and offers and you can have access to the same by searching for Innerchef coupons online and save big! To the ones who are wondering where to have access to the best of the Innerchef discounts and offers online from one website, can search for the same in HappySale and select from the multiple discount deals that are listed there. Here you have the chance to browse through the delectable platters that are on offer and get the same within your budget as your lunch or dinner at work or home. So keep browsing the best offers and get your best deal! When you are selecting from the best of the Innerchef coupon codes that are listed online you can select from options such as selecting the feast category and get a discount of 10% on the same and save more. Other than that there some of the best promotional discounts, cashback offers, site wide offers and also other occasional offers that keeps changing from time to time, so that you have access to the fresh deals and discounts. In addition to that, the brand also designs attractive discounts on your very first order. This helps you to save more and you can also inform your friends and family members who order food online about it. Furthermore, these offers also are a good choice when you want to treat yourself with your best food platter or your friends as well. You can save more as you order more platters. All you need to do is click on the “show code” of all the deals and offers and use this code when you are checking out and making the final payment and redeem your discount. If you want to make the most of the Innerchef promo codes, then all you need to do is keep browsing from HappySale and then select the offers that are listed. Here each offers come with a deal description that are useful as it lets you know about the deal so that you are clear on which offer you want to select and activate.